Distracting as the Parliamentary antics may be, in the outside world something rather tangible took place this week: a major (and fatal) gas explosion at Baumgarten, one of the biggest hubs in Europe sitting astride a very large quantity of Russian gas-flow into southern and eastern Europe, notably Italy. Early headlines were dramatic: "Italy declares state of emergency" and indeed "Gas shortage PANIC". Fair enough: no-one wants to be without gas in a cold December. Gas prices blipped upwards, unsurprisingly, and Europe wondered briefly if we were all going to freeze. But only briefly. European gas networks are far more interconnnected today than even five years ago and, importantly, market mechanisms have replaced the old system of government diktat that used to prevail over gas supply in countries like France and Italy until quite recently. When it comes to efficient allocation of scarce resources the combination of interconnection plus responsive market pricing is every bit as potent in practice as free-market theory would suggest. (That Europe now relies on this approach is, incidentally, a major triumph for the UK over years of patient work in the EC ...) That Baumgarten has already dropped from the headlines is even more of an achievement when you know there are several other logistical problems in the wider European gas system right now - and a cold snap to boot. It's also being reported that Baumgarten has already put many of the pieces back together again. Not wishing to downplay the fatality (nor the impressive photos of cars whose bumpers have melted), but natural gas fires are generally among the least problematic because (a) in this post-Piper-Alpha world, gas units have non-return valves everywhere, cutting off the supply of fuel to the fire very quickly; and (b) methane is so light, the short-lived fireball goes straight up into the air. Steel doesn't melt quite so easily. Hereabouts we used to debate with our old friend Sackerson the thorny issue of self-sufficiency vs reliance on markets. At one end of a spectrum it can sometimes feel pretty uncomfortable being dependent on a simple price signal to redirect international supplies your way when you're in trouble locally. At the other end, we know where 100% self-sufficiency leads: grotesque inefficiency - because 100% is never enough, is it? The monopolists always demand they be allowed to go for 200% or more - just to be sure. 'Security of supply': the last refuge of the statist scoundrel. What's the optimum? You don't always have a choice. Belgium, for example, has no indigenous gas resources, but they want to stay warm, like the rest of us. So they are 100% reliant on imports, plus a bit of local gas storage. We couldn't all do that: but the power of free trade, suitably regulated (e.g. to stop the French government intervening in situations like Baumgarten and blocking all exports, as used to be their wont), is not to be underestimated. They'll be OK in Italy, too. Surely it is a national strategic blunder to have allowed vast export of gas, principally sourced from north sea assets, over the last couple of summers, following the November 15 oil price crash and wholesale sell of of UKCS assets? What gain is there to be had from selling native supplies at rock bottom prices only to later buy it back from "Unreliable Foreigners" at a higher price? gas anyway is available in near unlimited quantities globally and the price of gas and oil are far apart. It is not an inflationary or cost driver in the same way that crude is. Because of nimby attitudes, perhaps? Don't get me wrong I go in for well ordered fracking as well. Again it seems to be a national strategic blunder that we are not gearing ourselves up with this capability. What evidence do you know of to suggest that gas is available in near unlimited quantities? Forgive my ignorance, what do you mean by it not being an inflationary or cost driver? Not nimby's Anon - environmentalists. I'd allow fracking under my house for a price. PS, anon - evidence that gas is available in near unlimited quantities? I cannot believe we're talking about a Corbyn government but here we are. I am sick of the Tories. The party needs to disband. E-K, I keep saying the same thing, but I know that I will turn out at the next GE and do my duty to prevent those Marxist loons from getting at the levers of power, and you probably will too. Sad, but I'd rather be a mug under a Tory government than a principled man under that rabble. "there are non return valves everywhere"
As far as the lines themselves are concerned I think you'll find that there are some extraordinarily long open pipes. Potentially, we have two big assets in this country. One is the shale gas; the other is the part-used nuclear fuel stored at Sellafield, which is said to be enough to supply us with electricity for a couple of centuries, once we have power stations that are designed to use it. OT, but of interest given the current campaign to encourage anti-Russian paranoia. Anon - that is hilarious, excuse me but I am a Russian bot and here is a Russian angle on things....subtle as a hammer and sickle! Non-return valves would not have helped Piper-A; the stuff was being pumped. 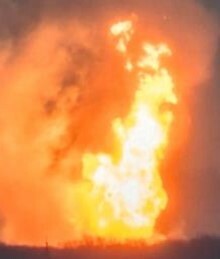 That's what caused the disaster - they recommissioned the condensate pump before the relief-valve was returned, ie they pumped liquid methane out of a 3" open end - quite near the flare stack. But your general point (that standards have improved enormously) is a fair one.